A child’s imagination can run wild with very little input at all, but imagine the fun they could have playing in one of these magnificent play structures from Green Town Toys! Jump in The Jolly Roger and you’re ready to sail. Protect yourself from intruders in The Citadel castle. Play whatever version of “house” you want in the Moon Roof Funhouse. Each structure is made from corrugated fiberboard that contains up to 42% recycled content and is certified by the Sustainable Forestry Initiative. And when its useful life is over, the structure is 100% recyclable! Alternatively, save on the production, packaging and transport costs of the purchase of this and instead use your imagination and an old cardboard box to make the same thing yourself. These type of toys are guaranteed hits at parties. Kids love to use their imaginations with these box creations. 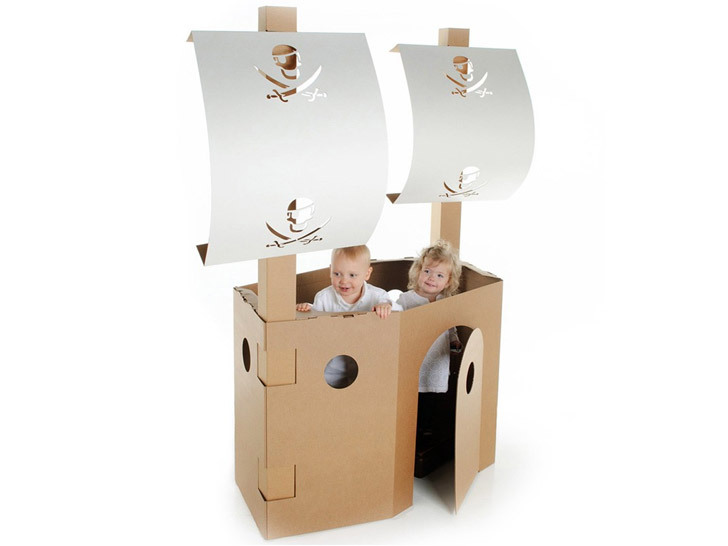 If you are looking for a THE gift that the kids will love then have a look at the pirate ships or castles. A child's imagination can run wild with very little input at all, but imagine the fun they could have playing in one of these magnificent play structures from Green Town Toys! Jump in The Jolly Roger and you're ready to sail. Protect yourself from intruders in The Citadel castle. Play whatever version of "house" you want in the Moon Roof Funhouse. Each structure is made from corrugated fiberboard that contains up to 42% recycled content and is certified by the Sustainable Forestry Initiative. And when its useful life is over, the structure is 100% recyclable!